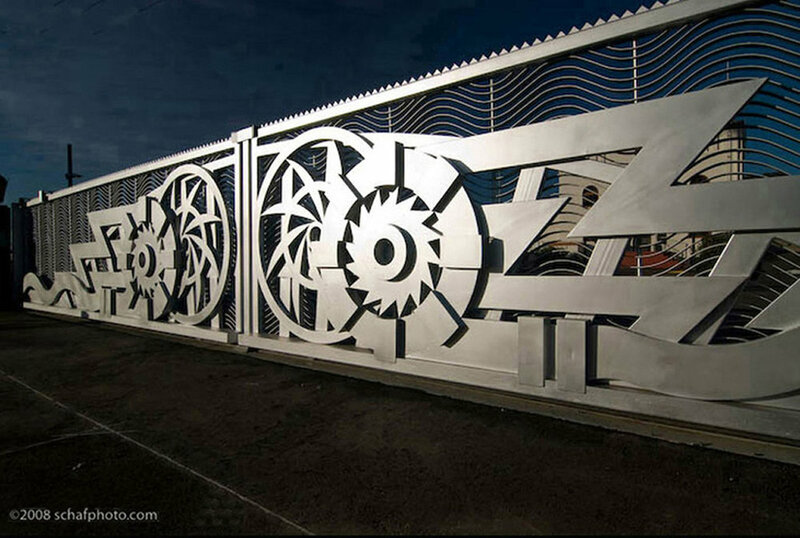 Works Projects Anthology: The plant’s historic Works Projects Administration era architecture inspired the art deco design of the gate that recalls the great artworks of the period that depicted machinery as heroic tributes to the technological advances of our society. Vessel Gate: is a center opening swing gate depicting an arch that is cut through with irregularly shaped rectangles that morph into the shape of a vessel. Project Description: Because it would be empty most of the time, the design solution for this 210,000 square foot emergency sewage storage pond addresses the concerns of nearby residences who anticipated a negative visual impact on the natural landscape. The use of color hardeners and the checkerboard construction technique blended the pond with nature by creating a giant pixilated reproduction of its natural surroundings. Awards: American Society of Civil Engineers, Outreach Award, 1998. Metropolitan Water District of Southern California, Liquid Art Award for “Viewage”, Pump Station 77, City of San Diego, Water/Utilities Department, 2001.